The application period has ended. The classes are in high demand so we cannot make any exception. Please apply next year between August 1st and August 31st 2019. Thank you for understanding. For informational purpose, you can still read this whole page. 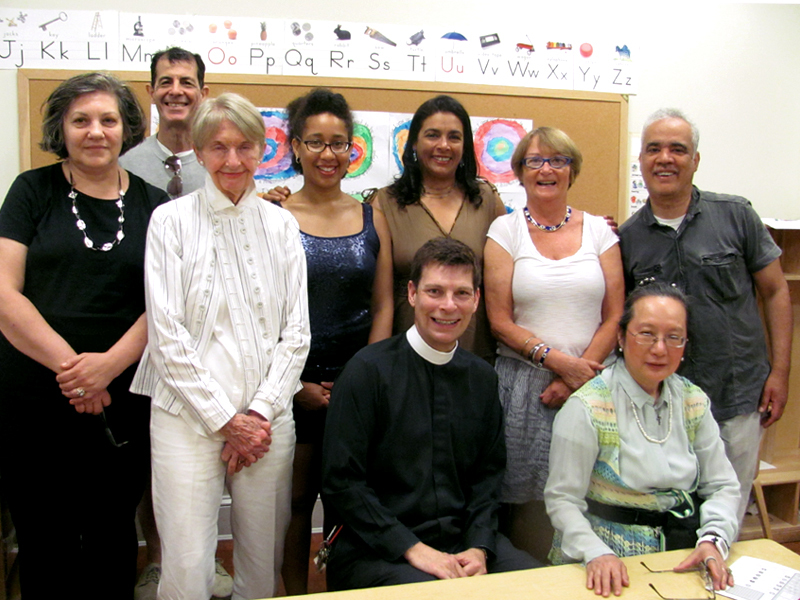 From September to the end of June, Saint-Esprit offers free French lessons on Sunday mornings from 9am to 10am and 10 am to 11 am in classrooms at 109 East 60th Street, next door to the church. Yes, these French classes really are free! We have offered this as a service to our fellow New Yorkers since 1884. If you are lucky and get a spot in our classes after applying, we will only ask that you purchase your textbook (from any book store, currently about $10-20). The application process is followed by a draw of chance. It takes at least 1 hour of full attention and the acceptance rate is 10% or less. Can I just register? There is an application process followed by a draw of chance. You will be registered only if your application is accepted and your name is drawn out. The purpose of this application is to test your motivation and attention. The application takes 1 hour to fill in. It is hard and requires your full attention for the whole hour. Most answers are in the question or at least an explanation on how to come up with the answer is included, all you need to do is pay attention and process the information, which is what you will need to do in class anyway. Students with the best grades will be put in a pool and then we will proceed to a draw of chance. This year, we expect the acceptance rate to be 10% or less! If these odds are not worth 1 hour of your time to fill in this application, you may reconsider applying now. Which class should I apply for? Please, read through each class description below, the requirements are clearly stated and you should be able to know if you qualify. What if I apply to the wrong class? You cannot change level once you applied, and you can only apply to 1 level, so as stated before, read thoroughly and take your time to choose. This is unfortunately due to some students trying in previous years to apply to classes with lesser-demand only to not meet the requirements and ask to be put in the beginner level. In our best effort to keep the application process fair for everyone, we ask you to take your time and make sure you meet the requirements before you apply. You have the whole month of August to figure it out. Take your time. Applications are not time sensitive. How do you select students? The test for each level is designed to make sure you will be able to follow through our lesson plan and are motivated enough to take the time to study on their own and commit to attending. However, there is still a chance factor because of the great number of applications we receive every year. To put it in perspective, we receive on average 1,500 applications every year. We try to accommodate about 300 students while our classes are best fitted to teach about 200 students, and there are students who completed a level in the previous year who come back the next year. We end up with a 10% acceptance rate or less. So even if you score 100%, you may not be drawn out. I applied for several years and never got in, can I get a special pass? Unfortunately, this is the case of many prospective students and we cannot make any exception. Even if we were to accept every student who applied for 3 years in a row without getting in, we would not have enough room for everyone. If you don't get in this year, please, try again next year. Now, please proceed to read the class descriptions as you will have to choose yourself for which level to apply. You cannot apply to 2 different level (automatic deletion). People who have no knowledge of French grammar. But also people who refer to their French knowledge this way: "I took some French in...", "I know some French..." If these are sentences you would have used to decide which level you should apply for, the Beginner level is most likely for you. The reason is that it is very important to perfectly know the basics. Without a safe grammar and spelling foundation, you will most likely stall and feel frustrated. Every year we see students who think they should apply for the Intermediate level or even conversation, but they do not have the qualifications. Please, refer to the "Who should apply?" section of other levels and make sure you KNOW the requirements. Philippe: Philippe is a native French speaker and French citizen. He was a business manager working in the cosmetic ingredient business until he retired a couple of years ago to explore new career opportunities. He was born in the United Kingdom to French speaking parents and educated at the French Lycée in London. As a child, he would spend the long summer breaks in France, either in Burgundy, Poitou-Charentes or Aquitaine with his relatives, exploring the landscape and culinary culture! Clarisse: Clarisse is a French and American Theatre Artist. She was born and raised in Lyon, France and moved to New York City in 2009 to pursue her Bachelors and Masters degree. She is currently developing a solo performance show, and is also passionate about languages and literature. For the past three years, she has been tutoring French to a variety of students around New York. Ruth: Born in Brooklyn, Ruth is an enthusiastic Francophile. She received her BA in French from Queens College and her MA from the U. of Nevada. She taught French and Spanish in Reno and Sacramento high schools for many years before returning to Brooklyn five years ago. Her French travels have included Paris, Lyon, Bordeaux and Rouen. In 2017 she attended the Sorbonne Summer University to continue her life-long study of French Literature. Currently involved in several French meet-ups, she also participates in two French book clubs! The Beginner level is following a steady fast pace. This means that you are expected to spend time on your homework during the week. It is our experience that 1h a week of French in class is only enough if you spend at least 2h a week at home working on your homework. Please, be aware of this before applying. There will be competitive tests throughout the year. Passing grades are expected to continue the course. To attend class, be on time, and participate. You are expected to know the previous week's lesson when you come to class (study) and have done your homework. People who KNOW how to conjugate and spell all most common verbs using these tenses in the indicative and imperative modes: passé-composé, imparfait, recent past (venir de + infinitive), present, near future (aller + infinitive). A good knowledge of French basic vocabulary is expected, along with correct spelling. Nigel: I'm the Rector (Priest) of St. Esprit, where I have been working for almost twenty years. Before coming to America I lived and worked in Paris and London after graduating from Birmingham University (UK) and Oxford University (UK) in Ancient Egyptian, Theology, Ministry and Islamic Studies. We will quickly start by reviewing the passé-composé and the imperfect, and move on to study the compound tenses, the future and the subjunctive. Grammar, pronunciation, vocabulary and conversation exercises will often be taught through supplementary handouts and audio-visual materials. Consistency in attending the classes, as we frequently build on materials from previous weeks to speed up conversation proficiency. Complete sentences in replying to questions (not just "Oui" or "Non" !) And not to forget to bring previous weeks' handouts to the class! People who already completed the Intermediate level. We will go over lessons that should be assimilated, but the emphasis will be on practicing what you already know orally. If you do not know well the imparfait or the conditional, you should go to the intermediate level. You should already know how the subjunctive works. Frédéric: I was born and raised in Paris, France. I graduated in Applied Foreign Languages from the university of Paris West University Nanterre while completing my last year at San José State University (CA). I am the Parish Administrator at Saint-Esprit and therefore you will hear mostly from me on administrative matters. Attendance and participation with other students. Homework should be done and you should arrive in class prepared and on time. TBD: Il y aura plusieurs professeurs qui feront des discussion thématiques. Un agenda des classes et professeurs sera préparé avant le début des classes. Cette classe est pour ceux qui parlent français couramment, mais il est possible d'expliquer quelque chose en anglais si cela est nécessaire. L'anglais doit être un dernier recours et évité le plus possible. Les sujets changeront selon les professeurs au cours de l'année. Ponctualité et participation. Tout le monde doit parler et participer. Kathleen: Paroissienne de Saint-Esprit avant l'arrivée du Rev. Nigel Massey. J'apprécie d'avoir l'occasion de fournir l'opportunité à mes étudiants d'améliorer leurs compétences en français. Je travaille actuellement en conformité juridique, où j'utilise mes compétences en français, italien, et espagnol. Nous ne parlons QUE LE FRANÇAIS. Nous discutons de sujets choisis par les étudiants allant de la musique pop francophone aux expériences de la vie actuelle de nos étudiants. J'attend de mes étudiants qu'ils soient investis (participent en classe, aident à ranger avant et après la classe, ...), et qu'ils participent au choix des sujets discutés.